something with its continuous scripture of leaves. * Quoted from the poetry collection A Scripture of Leaves (Brethren Press, 1989; 2nd. Ed., 1999). sparks a firestorm of words. eye on the back always turned. and meant to spit black rain. enough this body grows cold. This year marks the 50th anniversary of Norway's Nordland Railway. To celebrate, Norwegian Broadcasting Corporation produced a minute-by-minute documentary that involved recording four times — once for each season — the northernmost railway link between the historic (1,000-years-old) City of Trondheim and the old trading center of Bodo. It's a 10-hour trip! (From Oslo, it's a 90-minute flight.) The extraordinary undertaking is explained in "Nordlandsbanen: minute by minute, season by season." Below is a short that gives you some idea of what to expect from the beautifully filmed documentary, which may be viewed online in full (yes, 10 hours!) or downloaded in HD. Via Creative Commons licensing, a viewer may edit and remix the film, then share the result (the video mixer is provided at the link). If you're a world traveler, you'll want to add this to your Scandinavian itinerary. ✦ Congratulations to the Washington School of Photography and Capitol Arts Network on the opening of their fabulous new digs in Rockville, Maryland! I attended the grand opening earlier this week and was impressed and delighted by what has been accomplished. The renovated facilities on Wilkins Avenue, which provide more than 27,000 square feet of classrooms, galleries, photography studios, and workspaces for artists, are a dream-come-true. So much attention and hard work went into this project. Kudos to Missy Loewe of WSP and Judith HeartSong of CAN and their respective boards for this wonderful contribution to the community! If you live in the Washington, D.C., area, take a drive out and say hello. You'll be welcomed! ✦ In January Art21 launched the Art21 Translation Project with partner nonprofit Amara. The intention is to transcribe and translate Art21 videos about contemporary artists to make the videos accessible around the world. Initial plans are to bring 100 artists' voices to global audiences. ✦ This spring Lower East Side Printshop, New York City, is offering classes in water-based screenprinting (April 3 - May 8), solar plate etching (April 23 - May 28), and itaglio printing (May 15 -July 2). Sign up now! ✦ The video below, which comes by way of Ann Martin at All Things Paper (many thanks, Ann! ), spotlights the work and life of artists Lam Quang and Kestrel Gates, who design and craft gorgeous hand-made paper lights. Their artisanal work can be seen at HiiH (pronounced "Hi Hi") Gallery in Portland, Oregon. ✭ Duke University's Nasher Museum of Art in Durham is showing more than 100 photographic works from public and private North Carolina collections in "Light Sensitive". Organized around five themes, the exhibition examines how the camera has been and is used for social and aesthetic purposes. On view are a range of types of images, from early daguerreotypes to large contemporary C-prints. Among the famous photographers artists represented are Henri Cartier-Bresson, Walker Evans, Lee Friedlander, Emmet Gowin, Sally Mann, Aaron Siskind, and Vik Muniz; among the photographers from North Carolina are William Noland, Tom Rankin, and Margaret Sartor. A number of images are being shown for the first time. The exhibition runs through May 12. The Nasher also has mounted the first major solo museum exhibition of the work of multidisciplinary artist Wangechi Mutu, who was born in Kenya and currently is based in Brooklyn, New York. The show, "Wangechi Mutu: A Fantastic Journey", which continues through July 21, features more than 40 works from the mid-1990s to today, including collages, a monumental wall drawing, sculptures, a site-specific installation, and animated video. On public view for the first time are Mutu's sketchbooks. ✭ In Portland, Oregon, the Portland Art Museum continues through May 19 "Carrie Mae Weems: Three Decades of Photography and Video". The retrospective exhibition of the native Portland photographer's work, which has been reviewed extensively (the show originated at Frist Center for the Visual Arts), features more than 200 images, written texts, audio recordings, videos, and installations covering Weems's career over the last 30 years, including such major work as From Here I Saw What Happened and I Cried, Ritual and Revolution, and the more recent video project Constructing History: A Requiem to Mark the Moment. The show will travel to Cleveland Museum of Art, Stanford University's Iris & B. Gerald Cantor Center for Visual Arts, and the Guggenheim. The catalogue Carrie Mae Weems: Three Decades of Photography and Video (Yale University Press, October 2012) accompanies the show. ✭ Some 150 works from the Norma Jean Calderwood Collection of Islamic Art are on display through June 1 at the Arthur M. Sackler Museum (485 Broadway) of Harvard Art Museums, Cambridge, Massachusetts. Among the objects showcased in "In Harmony" are early glazed ceramics, illustrated manuscripts (folios of the epic poems Shahnama and Khamsa), and lacquerware. A free augmented reality app, providing access to audio, video, and Web links for various objects on view, has been created and a catalogue has been prepared for the exhibition. See feature article in Islamic Arts Magazine (December 2012). 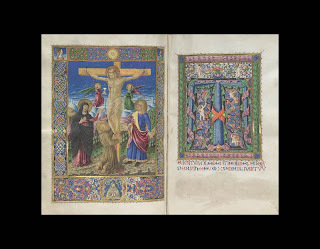 ✭ Cleveland Museum of Art is exhibiting through June 2 "The Caporali Missal: A Masterpiece of Renaissance Illumination". The manuscript, acquired by the museum in 2006 and on view for the first time, is the work of Barolomeo Caporali and his brother Giapeco Caporali, who decorated the missal for the Franciscan community in Montone, near Perugia, in 1469. Complementing the presentation of the missal are additional panel paintings and manuscripts by the Caporalis, as well as liturgical objects (including vestments, a chalice, and a processional cross) loaned by museums and churches in Umbria and shown in the United States for the first time. 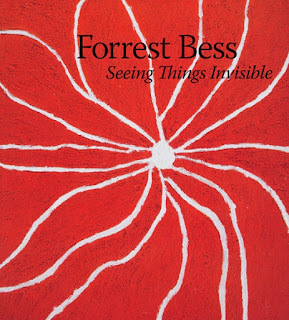 ✭ Work by visionary artist Forrest Bess (1911-1977) goes on view at The Mentil Collection, Houston, Texas, on April 19. 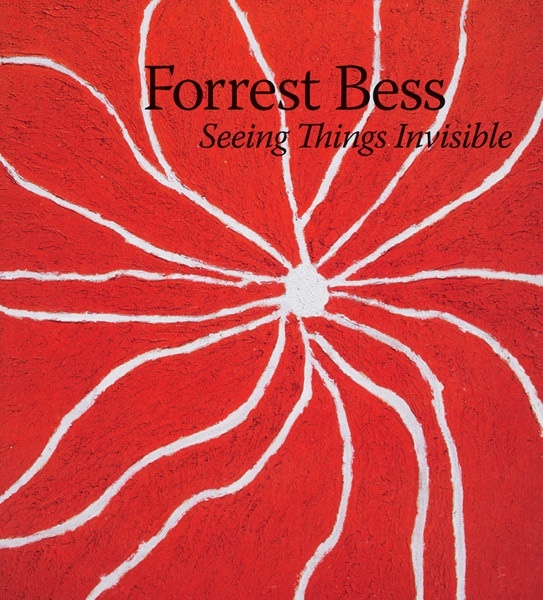 The exhibition, "Forrest Bess: Seeing Things Invisible", presents approximately 40 paintings and rare works on paper, as well as selected letters by the artist, who lived a rather isolated and impoverished life in a fishing camp outside Bay City, Texas, where he was born, and taught himself to paint by copying still lifes and landscapes. A prolific artist whose early works he sold for $10.00, he met influential art dealer Betty Parsons, who gave him six solo shows at her gallery in New York City between 1949 and 1967. The show, which will include Robert Gober's Forrest Bess installation for the Whitney, will continue through August 18 and is accompanied by a fully illustrated catalogue (see image above) published by Yale University Press and available in May. Prepared by Clare Elliott, assistant curator at The Menil Collection, the catalogue includes a contribution by Gober. Go here to view an interesting recent Antiques Roadshow feature about a Bess oil painting. The appraiser values the painting, to which is affixed on the reverse a price label of $150, at $75,000. Planning to be in London this spring or early summer? Don't miss the fascinating Wellcome Collection exhibition "Souzou: Outsider Art from Japan", on view through June 30. More than 300 works by 46 artists are being shown. You'll find a video preview, image galleries, a curator's essay, and additional resources at the link. The poetic and moving short film below, Ghost Vessel (2008), is by artist, textile scholar, and filmmaker Kathryn Lipke (b. 1939). Outraged over the looting and vandalism of the National Museum of Antiquities in Baghdad, Iraq, in 2003, Lipke built and then burned a 15-foot vessel, which she set adrift on a frozen river. * As you watch the abandoned vessel's slow procession, listen closely for the sounds that arise within the flowing water and melting ice: a heart beat, the last buzzing of a monitor signaling a heart is flatlining, and gunshots. The metaphor is beautiful and haunting. Camera work is by Ernst Michel; music is by Michael Bernal. Lipke is a professor emeritus in the Department of Studio Art at Concordia University in Montreal and docent professor of sculpture at the University of Lapland, Rovaniemi, Finland. She lives and works in Montreal and Vermont, where she maintains a studio on the North Branch River. Lipke's exhibition "Kathryn Lipke: In Search of the Garden of Eden" is on view through May 5 at Stewart Hall Art Gallery, Pointe Claire Cultural Centre, Pointe Claire, Quebec, Canada. In doing some research, I found out that in 1994 Lipke built a structure she titled Phantom Vessel, which is described in this very interesting piece on her 1996 exhibition "Spirit of Place" (pdf) at the Rovaniemi Art Museum in Finland. 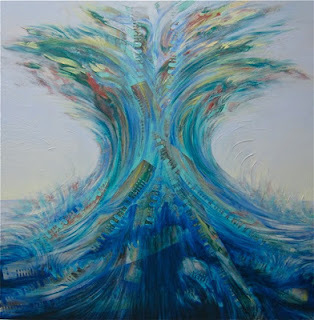 My thanks to painter Holly Friesen from whom I learned of Kathryn Lipke and her "Ghost Vessel". * This information accompanies the video on its YouTube page. our human relationship to the natural world. Award-winning Kate Casanova describes in today's accompanying video how she implants mushroom spores in chairs to produce conceptual artworks that engage our senses, challenge our visual vocabularies, and test our perceptions and limits of comfort. A University of Minnesota graduate student (she expects to obtain her master's in fine art this year), Casanova explores our culture's ideas about "unnerving" beauty and how those ideas influence our relationships with the natural world. See images of Casanova oddly beautiful Victorian Mushroom Chair (2011) with pink oyster mushrooms, and her 60's Mushroom Chair (2011), with blue oyster mushrooms. Her choice of mushrooms for each chair is deliberate and brilliant. Spend some time browsing images in her online portfolio. Her Floating World pieces, comprising gorgeous hand-cut paper collages, are captivating. Also see Casanova's 6:22-minute Ornament (2011). of ending the task you've begun. on the button, still pulsing. you, not content, make more. The Woodberry Poetry Room at Harvard's Lamont Library has mounted the interactive exhibition "Phone-a-Poem: A Selection of Archival & Newly Commissioned Answering Machine Poems (2013)" that allows visitors to pick up a back-to-the-future handset and hear the likes of Allen Ginsberg, Denise Levertov, Donald Hall, Jane Kenyon, James Tate, and Rose Styron read their work. All the archival poems were recorded on cassette tapes and none is longer than an answering-machine message. Contemporary poets Dan Beachy-Quick, Charles Bernstein, Forrest Gander, Anne Waldman, C.A. Conrad, and Oni Buchanan (aside: she's also a concert pianist) are among 15 poets who have contributed commissioned "answering machine" poems for the exhibit; most of these poets' recordings were made this year. Complementing "Phone-a-Poem", which poet Peter Payack began in 1976, are related photographs and letters from Hall, Maxine Kumin, Marge Piercy, and others. One of the ideas behind the exhibit is "poetry as conversation", according to the Woodberry Poetry Room's curator Christina Davis. As Davis points out in a statement to the Harvard Gazette ("Poetic greetings"), the installation underscores how the "technologies" of poetry and the telephone intersect, each relying on "the voice and on silence, on interpretation and timing," to communicate their message. "Phone-a-Poem" runs through May 1. As wonderful as it would be to explore the collection on-site, you don't have to travel to Cambridge, Massachusetts, to be able to listen to a selection of both the archival (digitized) and recently made recordings. Just go here. The recordings are listed alphabetically by poets' names, and the titles of each poem and year of recording are indicated. For upcoming events in the Poetry Room, see WPR Calendar of Events. Woodberry Poetry Room's Website offers a larger selection of highlights from the WPR audio archive at The Listening Booth. See my November 2011 and July 2012 posts that included information about Woodberry Poetry Room. or just behind the times. This poem is offered for today's photo prompt at Tess Kincaid's Magpie Tales (see image above). Go here to read other writers' responses to the prompt or to drop a link to your own contribution. the depth of my brother's voice. not here He is not He is. Grief is what lungs can't carry. Tomorrow, March 25, my brother Patrick would be 63. * I first came upon Joy Harjo's sentence "Lungs carry grief." while reading Ilya Kaminsky's and Katherine Towler's interview with the poet in A God in the House: Poets Talk Faith (Tupelo Press, 2012). It was the inspiration for my poem. * Quoted from David Batchelor, "The Whole Thing", Interview with Carmen Herrera, Frieze, Issue 152, January-February 2013. 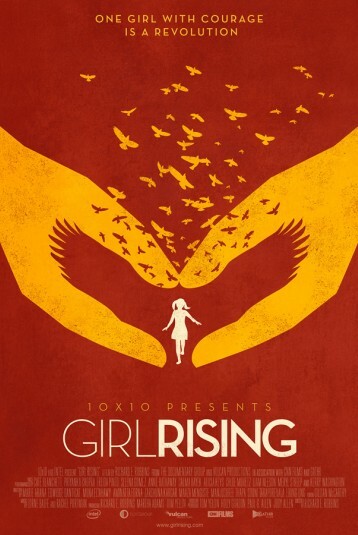 Today's Saturday Short is the trailer for the documentary Girl Rising, directed by Richard Robbins. The film shows us how education can change the lives of girls the world over. Girl Rising offers a series of vignettes: portraits of Sokha, "The Phoenix", an orphan left to forage in the dumps of Cambodia who becomes an accomplished dancer; Suma, "The Emancipated", who escapes servitude in Nepal to spread her message of hope and resilience and freedom; Ruksana, "The Dreamer", a "pavement dweller" in India whose father neglects his own needs to give his daughter a chance to realize her dreams; Azmera, "The Courageous", who says "No" when told she must marry at age 13; Senna of Peru, "The Warrior", who turns to poetry and is transformed; Yasmin, "The Defender", who shows us the meaning of resilience after being attacked violently in Egypt; Amina, "The Hopeful", a child bride in Afghanistan who refuses to be confined because of her gender; Luong, "The Writer", who tells in her series of memoirs the tragedy that befell her when she and so many of others like her were forced to flee the murderous Pol Pot regime in Cambodia; Wadley, "The Undaunted", just seven years old when Haiti suffers its devastating 2010 earthquake, leaving her homeless but determined to return to school; and Mariama, "The Catalyst", a teenager in war-ravaged Sierra Leone who becomes the first in her family to go to school and has her own radio show. The girls' thematic and inspirational stories are told by nine writers, including Edwidge Danticat, Sooni Taraporevala, and Aminatta Forna (each paired writer is from the girl's native country), and narrated by nine actors, including Meryl Streep, Liam Neeson, and Cate Blanchett. ✦ At Art21 you'll find the video series 100 Artists, comprising new and archival content made available weekly throughout 2013. Among the fine artists featured are Richard Serra, Sarah Sze, Roni Horn, William Kentridge, Louise Bourgeois, Shahzia Sikander, Susan Rothenberg, Carrie Mae Weems, Kara Walker, Ida Appelbroog, Alfredo Jaar, and Laurie Anderson. ✦ Artist Lisa Congdon is collaborating with Maria Popova at brain pickings to produce The Reconstructionists, which they describe as "a yearlong celebration of remarkable women across art, science, and literature, both famous and esoteric, who have changed the way we define ourselves as a culture and live our lives as individuals of any gender." I love what they're doing! Check in every Monday to read a new feature. ✦ A mosaic mural by Valerie Theberge has been installed at Smith Center's Joan Hisaoka Healing Arts Gallery in Washington, D.C. Theberge is among the artists in the Smith Center's Art Advisory portfolio. Images of some of Theberge's mosaics are here and here. ✦ Arts & the Mind, comprising the segments "Creativity" (56:22 minutes; see video below) and six other chapters, including "The Art of Connection" (55:34 minutes), is a PBS documentary about the role of the arts in human development. The series premiered this past September. Watch Creativity on PBS. See more from Arts & The Mind. ✭ The exhibition "Backstories: The Other Side of Art" at the Sterling and Francine Clark Art Institute, Williamstown, Massachusetts, covers five centuries of art, including paintings, works on paper, sculpture, silver, and porcelain by such artists as Albrecht Durer, John Constable, and Vincent van Gogh. Open through April 21, the exhibition aims to show the public the "hidden sides" of artworks, including special inscriptions or other features normally not seen. ✭ In Atlanta, High Museum of Art examines the evolution and production of Georgia designer Gogo Ferguson, in particular, the natural environment as inspiration for form and materials. Ferguson creates homewares (for example, fabrics) and wearable art inspired by flora and fauna, from the bones of animals, to shells, to lichen, to seaweed washed up on the shores of Georgia's barrier islands. 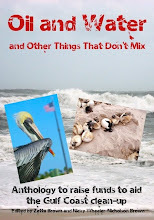 (She lives and works on the southernmost Cumberland Island.) Her jewelry includes natural bone bracelets and earrings (she uses, for example, gar, rattlesnake vertebrae and ribs, raccoon bone, and shark vertebrae). The installation "Gogo: Nature Transformed", showcasing designs made especially for the show (a wall sculpture inspired by seaweed) as well as work loaned by Ferguson's celebrity clientele, continues through July 7. This is the first museum exhibition of Ferguson's work. ✭ A selection of 31 wonderful, primarily abstract, prints by Gabor Peterdi (1915-2001) are on view at Indianapolis Museum of Art through October 13. The featured work, which shows off Peterdi's mastery of intaglio techniques, is from the museum's permanent collection. ✭ The Worcester Art Museum, Worcester, Massachusetts, continues through the end of the month "Jill Slosburg-Ackerman - In Rome: The Pine Grove. And. Natura naturans; natura naturata", a mixed media installation of a drawing project begun by Slosburg-Ackerman while she was a visiting artist at the American Academy in Rome in 2009. Inspired initially by observations of Roman pine cones and other natural forms and patterned stoned floors in medieval Roman churches, the work comprises hundreds of elements, from drawings and photographs, to paintings, sculptures, video, furniture, and hand-carved frames, that the artist has grouped into visual "episodes". Installation views are here. Creative invention in my work does not feel like willful innovation. 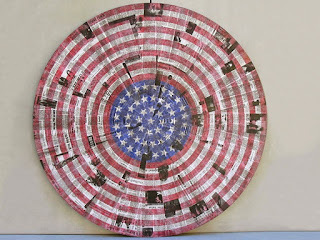 It feels more like a form of remembering. . . .
Today's post continues my ongoing conversations with artist Walt Pascoe. 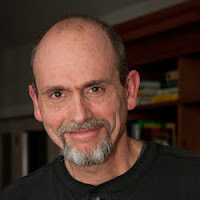 In Part 1, posted March 7, 2013, Walt talked with me about his background, artistic influences, sources of reference and inspiration, and creative motivations. Walt responds in this post to my questions about working in different media, his style, studio practice, and creative invention. MD: Walt, you draw, paint, and design and handcraft gorgeous furniture. What attracts you to each of these different media? WP: They all, at least the way I approach them, require a lot of physical energy and an equal degree of mindfulness at precisely the same time. So, they pull me into the present. Being fluidly creative in a preliminary design process for a piece with functional utility is certainly a different order of event than the more wide-open process [involved in executing] a drawing or a painting, where I can be more spontaneously improvisatory. I make sense of the distinctions by framing the issue as a conversation: A conversation with the physical nature of the materials and the technical demands particular to the engineering required. A conversation with the historical antecedents for the work I'm doing. A conversation with my own unconscious, and the common threads that keep arising over decades of focused work. It's a dialogue that carries me out of myself and into the world, then back again, to digest and examine my experience. MD: How would you describe your style? WP: Abstract, nonobjective, for the most part. I believe in the expressive potential of form and process sans overtly recognizable imagery—and the general appearance of my pieces reflects that. In a sense, I'm creating the visual analog of poetic compression and distillation of meaning. So, mark-making, shape, and color serve to embody the energy and emotion I'm exploring at any given time. That said, I'm hardly a pure formalist. The recent addition of saw blade shapes attests to that. [See image below and the image in Part 1.] I resist rigid ideologies and facile, over-intellectualized frameworks to stay focused on what, to me, is the real heart of the matter: our shared, felt humanity in all its mystery. "Sometimes when I start a sculpture, I begin with only a realized part, the rest is travel to be unfolded much in the order of a dream. 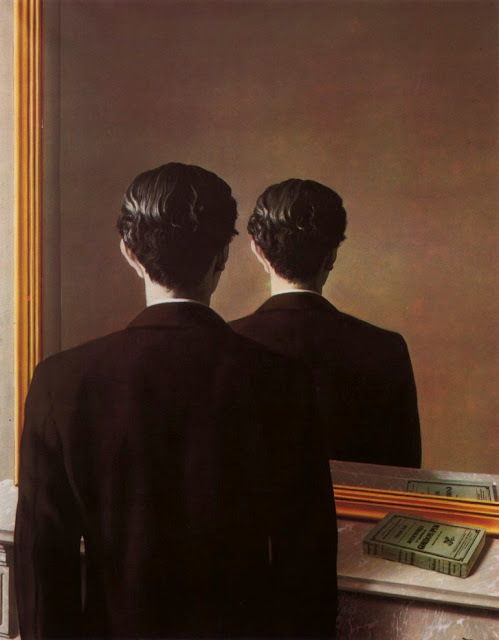 The conflict for realization is what makes art not its certainty, nor its technique or material." [What] frequently results [is] work that retains visual evidence of the searching and revision. Erasure, translucent layers, and the mark of the human hand at work are all given a prominent role in my formal vocabulary. MD: In what ways has your style evolved over your career? WP: Like that of most artists, my early work was derivative; its most salient characteristic was naive enthusiasm. But over the years, a pattern slowly emerges, if you keep at it. In my case, my style has involved a cyclical oscillation of sorts — perpetual movement and seeking — propelled by the creative tension generated through engagement with particular dialectics. Forces that appear to be contradictory — Apollonian and Dionysian impulses, for instance — but that can't exist without one another. In my practice, evolution can be envisioned as a constant circling back through themes, [although] across time, it all looks more like a stretched-out coil spring rather than a circle confined to a single plane. © Walt Pascoe. Used With Permission. MD: How, typically, do you work, Walt? Do you work at particular times of the day; have a specific routine you like to follow; work on more than one idea at a time; need quiet space, music, etc.? WP: [My work pattern] tends to parallel the oscillations I mentioned earlier. There are periods of structured discipline, especially when working through procedural matters related to the construction of furniture or mastering the technical issues of a particular art medium. There [are] periods of frenzied, explosive forays into uncharted territory, [which] can often mean sleepless nights and dream-like, distracted days that are quite the opposite. At times, I find myself being orderly, scientific, and empirical in thought and habit. Then there inevitably comes a moment when I need to let that go and swim in murkier waters. The interesting thing is the way these modes need to interact and play off of each other for anything substantive to result. The feedback loop fascinates me and is part of what animates my work. MD: In your Artist's Statement, you describe your creative invention as "a form of remembering". That implies autobiography. What are you "remembering" while courting your muses? Additional selections from my conversations with Walt are forthcoming. On Thursday, April 11, 2013, Walt will be showing his work in Montreal. The studio event, "Au Coeur de Saint-Henri: Oeuvres Recentes de Walt Pascoe" ("In the Heart of Saint-Henri: Recent Artworks by Walt Pascoe"), will take place between 5:00 p.m. and 7:00 p.m. at 4710 rue Saint-Ambroise, Studio 349. In addition to taking advantage of the opportunity to see and purchase Walt's works, enjoy music, hors d'ouevres, and libations. For more information, telephone (514) 713-6583; e-mail Walt Pascoe at waltpascoe[at]gmail[dot]com or Holly Friesen at hollyfriesen[at]gmail[dot]com.
. . . This is the memory of the landscape. That landscape is gone. It may never be seen again in the history of civilization. . . . Assigned by National Geographic to literally capture on film the effects of climate change on earth, environmental photographer James Balog, initially not a believer in climate change, became an "ice chaser". Following his 2005 trip to Iceland, his mind dramatically changed, Balog undertook an extraordinary multi-year project —"The Extreme Ice Survey" — to document with time-lapse cameras the alarmingly rapid melting of the Arctic's magnificent glaciers. (The EIS is ongoing.) The feature-length documentary that resulted, Chasing Ice, premiered at Sundance Film Festival in January 2012. It is a stunning visual record of Balog's and his team's efforts to shoot destruction as it happened. It is evidence that we ignore to our peril. Below is the official trailer for the film, which to date has won nearly two dozen film festival and cinematography awards, including the Environmental Media Association's 22nd Annual "Best Documentary Award". Current screenings of the film around the United States and in Canada and the United Kingdom are listed here. Information about Balog's book Ice: Portraits of Vanishing Glaciers (Rizzoli, 2012) is here. Go here and here to see some of Balog's breathtaking stills. Also see Balog's informative 20-minute TED Talk "Time-Lapse Proof of Extreme Ice Loss", first posted in 2009. A list of resources on climate change is here. The phrase "A line in long array" is from Walt Whitman's "Cavalry Crossing a Ford". All things Dante Gabriel Rossetti (1828-1882), from the poetry of the English pre-Raphaelite to images of paintings, letters, manuscripts, and designs, are found in the Rossetti Archive. Created between 2000 and 2008, the Web-optimzed archive is home to a wealth of textual and pictorial materials in Rossetti's 1879 volume Poems, 1861 book of translations The Early Italian Poets, and the 1881 publications Ballads and Sonnets and Poems: A New Edition. Materials in this rich archive are arranged chronologically and alphabetically under the headings Double Works (included is an interactive Timeline), Pictures (Rossetti's artwork, also with a Timeline), Poems (plus Timeline), Prose, Translations, Books, Manuscripts, Correspondence, and Material Design. Under this latter heading are found an A-to-Z list of craft design work, including, for example, architectural sketches, book bindings, and designs for furniture, wallpaper, titles, and jewelry, as well as monograms and stationery. Contextual material appears in Related Texts (critical and historical materials to enhance the study of Rossetti's work), Visual Works by Other Artists that relate directly to Rossetti's work or illuminate it, and Contemporary Periodicals. A representative Bibliography and list of cited works rounds out the principal offerings. Substantive and substantial editorial commentary, notes, and glosses enhance the primary source materials. Currently, all the documents in the the archive are coded so that they may be searched by title, phrase, genre, name, and date; included is a boolean search function also. A guide to additions to the archive, though additions are not made regularly, is available. The site is a marvelous example of what can be done to promote research, scholarship, and education when public and private institutions and collectors work together. (See list of contributors here.) Users should note that permission has been granted for the use in the archive of textual and pictorial documents and that all rights to the documents are reserved and under copyright. Also noted on the site is an open-source pilot aggregation of 19th Century resources, called Nines (Network Infrastructure for Nineteenth-century Electronic Scholarship) designed to make available peer-reviewed online scholarly work on British and American literature and culture. When completed, it will be integrated fully into the archive to facilitate users' collection and annotation of the archive's digital objects and to permit customizable online exhibits of peer-reviewed texts and images. Two such exhibits are in development: a biographical introduction to Rossetti and a chronology of Rossetti's life and work. Sponsored by the Institute for Advanced Technology in the Humanities, University of Virginia, the archive is funded in part by the National Endowment for the Humanities and the Andrew W. Mellon Foundation. Grants and other support have come from IBM, University of Virginia, University of Michigan Press, and J. Paul Getty Trust. Many programmers and analysts, consultants, research assistants, and others contributed to the creation of the archive. The first day of spring is Wednesday, March 20, which also is opening day in Washington, D.C., of the National Cherry Blossom Festival, which will continue to April 14. Saturday Short is marking the imminent new season and the festival with "Blossom Storm", a celebration of poetry, dance, music, and cherry blossoms, a video presentation from Haiku Chronicles. Enjoy! Haiku Chronicles Episode 18: Blossom Storm from Haiku Chronicles on Vimeo. ✦ The national competition Looking@Democracy, offering $100,000 in prize money, is seeking short creative media pieces. Entries should either tell a story about why government is important to our lives or how we might together strengthen American democracy. Acceptable submission media include videos, audio clips, animation, music videos, public service announcements, infographics, and digital graphic art. A category for emerging artists is intended for students, youths, and nonprofessionals. The deadline is April 16. Looking@Democracy is a project of the Illinois Humanities Council. ✦ April 19 is the deadline for applicants for USArtists International 2013 grants for projects taking place between July 1, 2013, and June 30, 2014. Instructions and guidelines are at the link. ✦ The National Arts Education Public Awareness Campaign offers some facts about arts education's importance to child development and 10 Simple Ways to get more art in your child's life. ✦ Individuals, collectives, and community-based organizations in the United States, Mexico, and Central America may compete for Transnational Cultural Remittances grants of $2,000 to $20,000. Submissions should be for art activities that support, preserve, or extend cultural practices among linked communities in two of more of the following: Belize, Costa Rica, El Salvador, Guatemala, Honduras, Mexico, Nicaragua, Panama, and the U.S. The deadline for 2013 grants is April 4. ✭ In Wausau, Wisconsin, Leigh Yawkey Woodson Art Museum continues through April 7 the traveling exhibition "Folding Paper: The Infinite Possibilities of Origami". More than 100 works by 40 artists from 13 countries, including Giang Dinh, Eric Joisel, Michael G. LaFosse, and Bernie Peyton, exemplify the mastery of this often stunning art form. The show travels to Crocker Art Museum in Sacramento, California, in June and to Oregon Historical Society, Portland, Oregon, in October. Images, video, and additional information about the exhibition may be found here. The museum also is showing the work of paper sculptor Calvin Nicholls, who uses only X-ACTO® knives, toothpicks for dabbing glue, and paper to create his striking 3-D works. This exhibition, too, runs through April 7. ✭ The James A. Michener Art Museum, Doylestown, Pennsylvania, will open "Infinite Mirror: Images of American Identity" on April 13. The exhibition of more than 50 multimedia works (paintings, works on paper, photographs, video) by such well-known artists as Faith Ringgold, Jacob Lawrence, Luis Jimenez, Tomie Arai, and the late Elizabeth Catlett-Mora examines the use of portraiture and figuration to express emotional and social ideas and to depict the circumstances and experiences of multicultural populations in America. The exhibition, to run through July 7, will travel to Juniata College Museum of Art, Washakie Museum & Cultural Center, Foosaner Art Museum/Florida Institute of Technology, and Richard E. Peeler Art Center/DePauw University. 30" x 30" x 1-1/2"
✭ "Journey Through Mountains and Rivers: Chinese Landscapes Ancient and Modern" continues through April 28 at The Nelson-Atkins Museum of Art, Kansas City, Missouri. Highlights include a number of extremely fragile Song Dynasty paintings, which will not be displayed again for 10 years, and the first showing in the United States of the beautiful paintings of Xu Longsen (see images of his work here). ✭ Thirty paintings and drawings by Boston-born African-American artist Lois Mailou Jones (1905-1998) are on view through October 14 at the Museum of Fine Arts Boston. The exhibition ranges over Jones's entire artistic career. In addition to painting hundreds of portraits, she worked in textiles, designed masks and stained glass windows, and taught art. ✭ If you're lucky enough to be in New York any time before August 4, head to the Brooklyn Museum to see "Gravity and Grace: Monumental Works by El Anatsui". The artist's first solo show in a New York museum, the exhibition presents more than 30 works in metal and wood that El Anatsui has transformed, as only he can, into site-specific sculptures. Twelve of his recent large-scale wall and floor sculptures are featured. The metal pieces are made with bottle caps from a distillery in Nsukka, Ghana, where the artist lives. I've been privileged to see his work, which I find unforgettable. 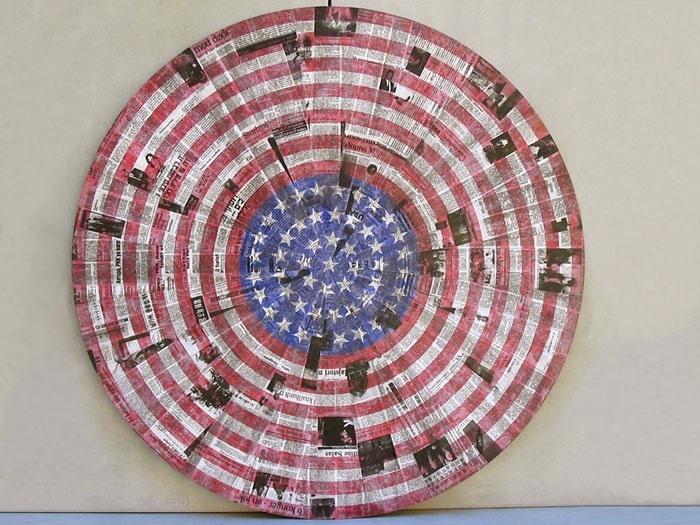 Trailer: Fold Crumple Crush: The Art of El Anatsui by Susan Vogel from Susan Vogel on Vimeo. Also see Susan M. Vogel, El Anatsui: Art & Life (Prestel Publishing, 2012). El Anatsui at the National Museum of African Art, Washington, D.C.
of a society and an age. For his multi-media projection installations, Canogar uses already obsolete, discarded, or increasingly disappearing 35mm film, VHS tape, DVDs, analogic television screens, electric cables, telephone wires, multimedia hard drives, projectors, LED screens, and an assortment of other materials, including photographs. Many of his creations are, visually, quite beautiful. Their titles often are derived from classical sources, and their interplays of light, color, and movement transfix. At the same time, the works make subtle statements about new technologies' role in our lives. Canogar is, he says, especially "interested in how technology blurs our bodily boundaries, and how communication technologies extend our sense of self. . . I'm seduced by access to the endless communication that the Internet promises but also overwhelmed by social networking. . . ." (E-mail interview with Curator N. Elizabeth Schlatter, December 2012). Public art pieces by Canogar, who exhibits around the world, can be found in Houston, Texas, where his sculpture Waves (2012), made of LED tiles, has been installed permanently at 2 Houston Center; Madrid, Spain, where his photo-mosaic Constelaciones (2010), made up of 6.650 million recycled glass chip tiles and photographs, was commissioned for two pedestrian bridges over Manzanares River (Madrid Rio Project); and New York City's American Museum of Natural History, which commissioned Synaptic Passage (2010), comprising 500 kilos of recycled electric cables, projectors, and video animation, for the exhibition "Brain: The Inside Story". In addition, three artworks are at Jaleo, Jose Andres's restaurant in Washington, D.C. In a video interview for the Bildmuseet exhibit, Canogar talks about his artistic vision and the four works on view. Canogar's creativity astounds. You'll want to spend some time looking through the projects section, organized by year, at his Website.